Modified over the years, originally a Tudor artillery fort, the castle now represents centuries of history with particular focus on the Duke of Wellington who lived and died there. The castle also has extensive formal and informal gardens. 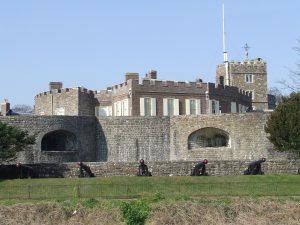 One of the three castles built on the orders of Henry VIII to guard the sea off Deal, the castle has developed over the centuries into the official residence of the Lord Warden of the Cinque Ports. Cared for by English Heritage, you can explore the castle, eight acres of magnificent gardens, woodland, and sea views. The interior of the castle tells the stories of many of its famous residents including William Pitt the Younger, the Duke of Wellington, WH Smith, Winston Churchill and the Queen Mother.